You can use Photoshop’s Clone Stamp tool to reduce a bit of a bulge at the waistline or below an upper arm, but you might find it easier (and more natural-looking) to make a selection and rotate the outer edge inward a bit. Take a look at this figure. Although this subject hardly has what you’d call a “spare tire,” that bit of extra sticking out above her skirt isn’t particularly flattering. 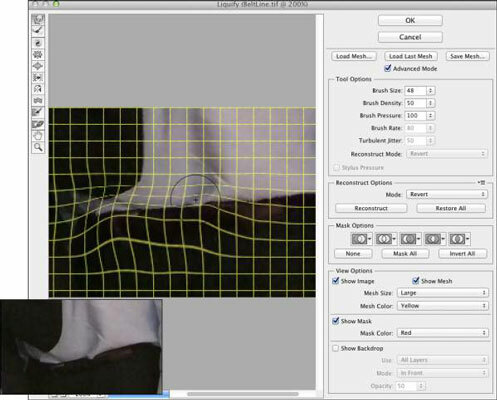 Make a selection with the Lasso tool that includes some of the background and some skin (or shirt or dress). Copy the selection to a new layer with Cmd+J/Ctrl+J. Press Cmd+T/Ctrl+T to enter Free Transform (or choose Edit→Transform→Rotate). Drag the point of rotation (the little crosshair symbol in the middle of the bounding box) to the top of the bounding box, and then position the cursor slightly outside the bounding box and drag to rotate. When working with double chins, your best bet is usually to minimize rather than eliminate. Putting a skinny neck under a fleshy face looks unnatural. You can certainly tuck in the sides of the second chin a bit by using the rotate method, but rely on the Burn tool to darken. By darkening the excess flesh under the chin, you make it appear to be in shadow — and, therefore, under the actual chin. Use the Dodge tool or the Clone Stamp (if necessary) to hide any creases or wrinkles associated with the excess chin. Redefine a natural-looking jaw line and chin — but once again, remember that the result must not only be acceptable to the client; it must also look natural. Burning and dodging can reduce even a very prominent double chin. When working with the Burn and Dodge tools, don’t forget to reduce the Exposure setting in the Options bar — 15% to 20% is plenty strong for this type of work. You’ll also want to juggle between Highlights and Midtones (the Range setting in the Options bar) when creating an artificial shadow on a double chin with the Burn tool. Zoom in when doing this sort of work, but also open a second window via Window→Arrange→New Window for [filename] to keep an eye on the overall impact of your changes. You can use the Filter→Liquify feature to push, pull, twist, pucker, bloat, and otherwise manipulate pixels into the shape and position you need. There’s really nothing more powerful when it comes to reconfiguring a figure. In the figure, you see how leveling off a beltline in Liquify is sometimes all that’s needed to restore that trim-man-she-married look. And a little touch-up with the Healing Brush or Dodge and Burn tools can eliminate the wrinkles in the shirt, helping improve the overall appearance of the image by reducing distraction. Make sure to select the Advanced Mode check box when working with Liquify in order to access all of the features shown. The original beltline is shown to the lower-left.